Do you need some technical assistance or help with Solid Edge? All Solid Mastermind members can use the Solid Edge Q&A Solutions Vault. 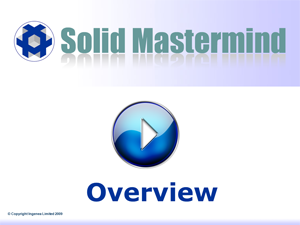 In addition Solid Mastermind Platinum Members are able to pose any technical question about Solid Edge and have it answered by product experts. They can ask as many questions as they wish. The chances are that if you are experiencing a common challenge with Solid Edge then the answer is already waiting for you inside the Solutions Vault. The answers in the Solutions Vault are not just restricted to simple text either. Sometimes it can be difficult to explain the solution to a technical problem without some sort of visual/audio aid. Where appropriate the answers are enhanced by instructional audio and video, and downloadable files. In summary the Question & Answer Solutions Vault gives you multimedia online help and technical support for Solid Edge. The vault will continue to get bigger and bigger and therfore more and more valuable as fresh new question and answers are continually added. It can be browsed using the Solid Mastermind Q+A navigation on the right of this page. Alternatively as the Solutions Vault is indexed you can use a search to find relevant questions and answers quickly and easily. You do this using the site search feature at the top right of this browser window. The Solid Mastermind search facility aims to make it as easy as possible for you to find the right information as quickly as possible. It does not present a complex set of search options. Instead a search is performed across all training content, and can be made using a similar syntax to what is used in popular search engines such as Google or Yahoo. Searching for sweep - would find all content that contains the word sweep. Searching for adjust* - would find all content that contains words beginning with adjust. Searching for +round +blend - Would only return content that contained both round and blend. Searching for +round -blend Would only return any content that contained the word round and not the word blend. Searching for 'dimensions and constraints' - Would find all content that contained the exact phrase. 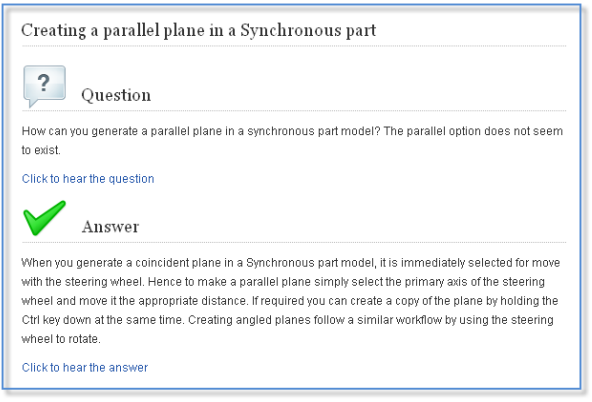 Learn how to access and use Questions & Answers by viewing this overview video.